Metal is good. Cartoons are good. Sometimes, on certain Saturdays, I can be found at my flat, watching Spongebob or Dexter’s on video and/or DVD, on mute, while supping a cup of tea to the sound of metal emitting from my stere-ere-o. C’est vrai, my friend, monsieur, oui oui. So when I got wind of the creation of a show that combined both these brilliant inventions of humankind, I was quite literally excited; so much so, actually, that I may have made a small mess somewhere. By that I mean I ripped open the package that finally arrived from The Cartoon Network, tossing bubblewrap about my lounge like slivers of meat flying from a T-Rex’s jaws as it obliterates a recently-deceased Triceratops. 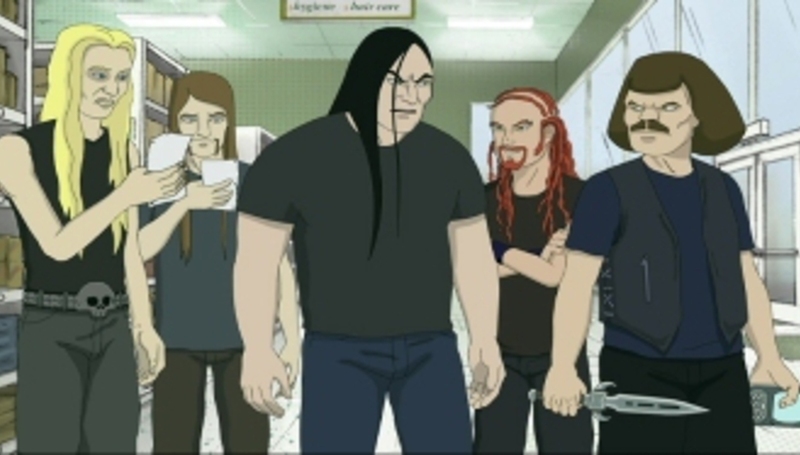 So, anyway, Metalocalypse. It’s a show – two episodes of which were in said package – going out on Adult Swim, the Cartoon Network’s adult-only sister service (click here for a link) that’s also home to the quite ridiculous Aqua Teen Hunger Force and Minoriteam, as well as relative standards like Family Guy and Futurama. It’s a show about a metal band, Dethklok, “the world’s most popular band”. They are comprised of Nathan Explosion on vocals, Skwisgaar Skwigelf on guitar, Toki Wartooth on guitar, William Murderface on bass and Pickles on drums. They are Scandinavian. They write jingles for coffee commercials. They are idiots. They kill, maim, destroy, et cetera wherever their tour takes them. Yes, it sounds silly. Yes, it is silly. And brilliant. The show’s creators are Tommy Blacha and Brendon Small, veterans of shows such as The Ali G Show and Late Night With Conan O’Brien. Small writes the music for Metalocalypse. He might well be the fastest cartoon guitarist alive. DiS ‘spoke’ to Blacha and Small, via the medium of what the kids are calling ‘electronic mail’, or ‘e-mail’, before the show’s first proper airing on August 6. This is what they said. Yeah. You know how interviews work, right…? First up, WHY a metal band as the stars of a cartoon? Is it because of metal’s burgeoning success – the likes of Trivium and Mastodon are crossing over into the kids’ psyche – or because you have a fondness for the genre? Small: It's metal because we love metal. That's why. I love that good metal is getting out there. The world needs it. There's nothing like it. Blacha: To me, metal’s success is not burgeoning – it never went away. We weren’t looking at trends to start a successful show… we are true metalheads. While the show’s obviously tongue in cheek in its presentation of a metal band, presumably traits were taken and exaggerated from existing acts: are individual band members based on any particular musicians? Small: No band member is representing any particular celebrity, but rather a combination of metal archetypes that we think are interesting. Swedish guitar gods, brooding vocalists, self-hating bass players, the rhythm guitarist who gets pushed around – if you've been in a band you might know a few of these dudes, or you might be one of them. What I'm saying is: get out there and start a band. Be creative. For once. Blacha: (The band is) just a wonderful goulash of awesome archetypes. Blacha: You’re being silly and rather unorthodox and possibly illegally perverse. You have deviant thoughts. You must be killed. Can I make a dead skin mask out of you? That way you could live forever. Was there a series of arguments over what to call the band? What were the alternatives, if any? Does ‘Dethklok’ capture the essence of the band in the way you’d hoped? Small: Dethklok sounded very cool and very stupid to me at the same time. That's our recipe for doing things here. If it's cool and stupid, it's in. Period. Question mark. Period. Blacha: The band is named after our favourite civil war general, Stonewall Jackson. One of the two preview episodes I’ve seen follows the band as they record on a nuclear submarine – presumably the additional pressure is necessary to make the most HEAVY metal album imaginable, but where can the band go from there to be MORE metal? Small: I think they should split open a dead elephant and track their guitars in its rancid guts – that would be pretty metal. Blacha: Only a long and hard journey of watching all the shows and buying all the DVDs and t-shirts can answer that. Small: Death is funny, in a horror movie way. You're going to die one day. It's the ultimate slapstick. That's kind of funny. To me. Blacha: There was nothing scant about our regard – it was a mistake. Anyway, to you, the writers: your previous comedy credits are impressive – where can Metalocalypse rank among your past achievements, personally and in the eyes of the public? What are your realistic hopes for the show? Small: It’s the ultimate job. I get to write music and play guitar all day until my shoulder hurts. That's pretty much what I'd rather be doing instead of working, anyway. Blacha: I just hope people like it and get it and die watching it. It is my most metal achievement besides the birth of my twins joined at the head. How is the anticipation in the States? Is the feedback you’ve received thus far positive? Small: It's been really cool to get e-mails from metalheads and non-metalheads, freaking out over the trailer (that’s been on-line) for the last three months. Blacha: We have been arrested. Small: Yes, it's actually in the works. I just need to hire a couple musicians. Do you know any guys with ‘dread overs’ that can do a good blast beat? Blacha: Please write your local Senator and demand it. I hope so… I hope so.